Sharpen your skills with one of the oldest hunting tools known. We've taken the common slingshot and added stability and accuracy, unheard of with this instrument. 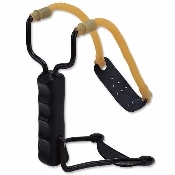 The unique arm support adds to the durable polylatex sling. Ideal for hikers, back-packers and small game hunters.